Old Montauk Hwy branches off from Rte 27 at Deep Hollow Horse Farm. There is no parking along this mile long road and plenty of “private” signs. At the very end, however, just after the road becomes a dirt road, there is a tiny area that can accommodate just 2 cars. Just thereafter, the road is barred by a gate beyond with you are in Camp Hero State Park. Pedestrian can get around the gate and “Old Montauk Hwy” continues all the way to Montauk Point and most of the way it is off limits to motor vehicles. There are other parking spots that provide access to “Old Montauk Hwy”. 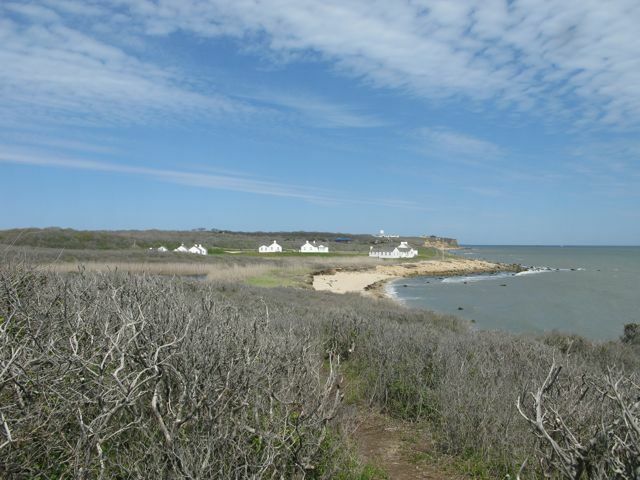 You can leave your car about 2/3 mile north at the Camp Hero State Park parking just off of Rte 27, and you can leave your car at the large parking lot by Montauk Point. Camp Hero is a military area with a history dating back to the American Revolution! Camp Hero was built during 2nd WW when German U-boats were threatening the East Coast. The most conspicuous relic is the huge radar erected during the cold war and meant to protect against incoming enemy bombers (1948-1957)! 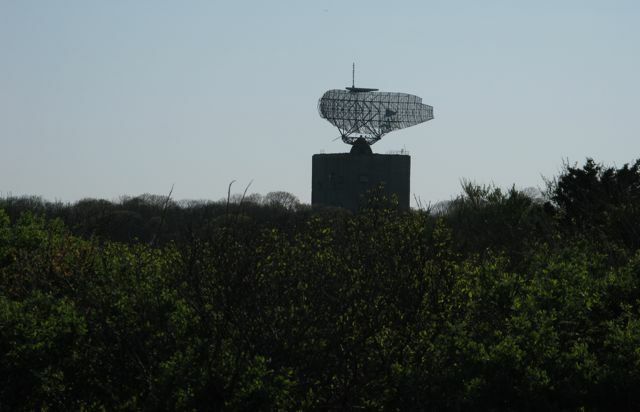 Read more about the “Montauk project” here. lookouts all the way to Turtle Cove, a small sandy cove just by Montauk Point. There is a system of small paths, for hikers only, that link these lookout points and follows the bluff quite closely. We highly recommend that you explore these paths, as there are many sensational views of the ocean that are not visible from Old Montauk Hwy. For access to the beach proper you can scramble down the bluffs by Driftwood Cove (on the western end), you can gain easy access by Stony Brook (midway) and by Turtle Cove (on the eastern end). 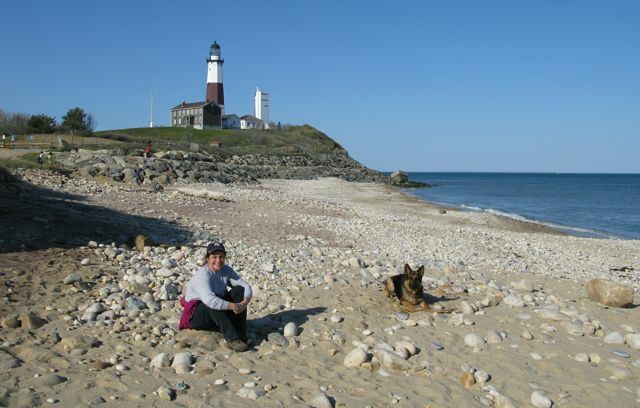 The beach itself extends from Caswells Point (west) to Montauk Point (east). Beyond Caswells point to the west is Tuma’s beach and the Site of Miss Agnew’s Pond (see next entry, No 25). that must have been washed away from their original site coming down the bluffs to provide access for private homes. 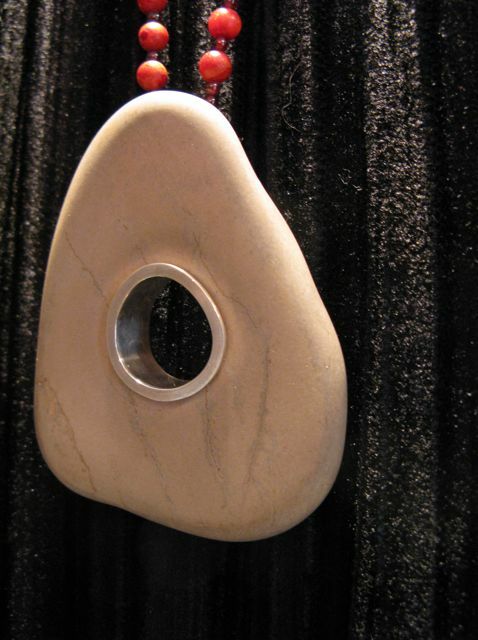 The most frequent shells are moonshells (Naticidae) which we like to use for jewelry! 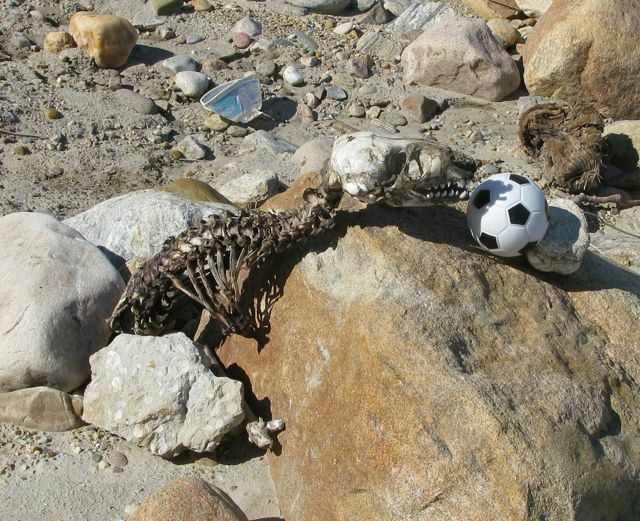 We found a skeleton of a dog, laid bare with its favorite ball toy (? ), in the same way that some Indian tribes laid the bare bodies of their deceased on wooden platforms. We also found the remains of an uncommon fish propped up on a log looking out at the ocean: I think this is a Shortnose Sturgeon which is an endangered species! Finally, this was our last walk, thus completing all 40 beaches of East Hampton town, a reason to celebrate with a glass of wine! It took us nearly 6 months to walk all these beaches and our walks totaled more that 140 miles. OK – I admit – this place is remote! There are 2 ways to get there. 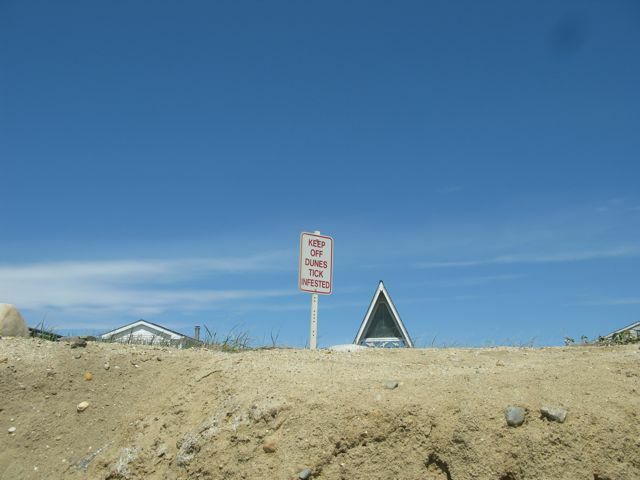 You can leave your car at Ditch Plains Beach, where there are several parking areas just west of the Montauk Shores Mobile Home Park, which is now a condominium complex without public access to the beach. 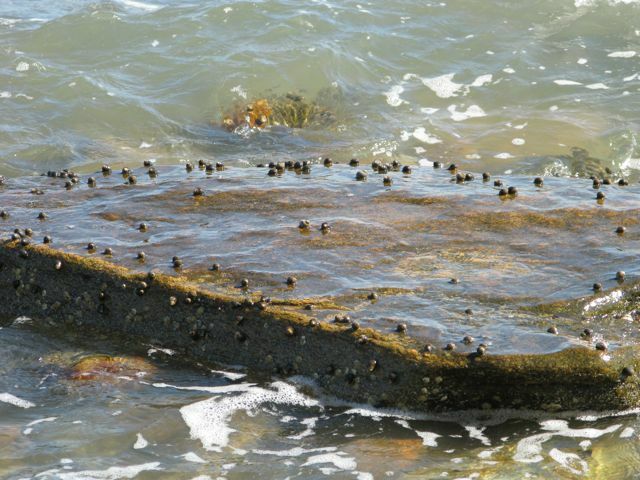 Best to time your walk at low tide to get around the rocky area in front of Montauk Shores. Walking east there follows a succession of sandy coves and then rocky points with towering bluffs. After the first cove you get to Cottage Point, then Great Bend Cove, then Frisbies Point, then Morgan’s Cove and “Amsterdam Beach”. There are some old white washed buildings here which are part of the Andy Warhol Preserve. We turned around when we got to an area with 100 foot high cliffs, roughly at the site of “Miss Agnew’s Pond” (which is a small pond on top of the bluffs and not visible from the beach). On our way back we took a path by Lily Pond, that led up the bluffs from where there were great views (like the one shown here). 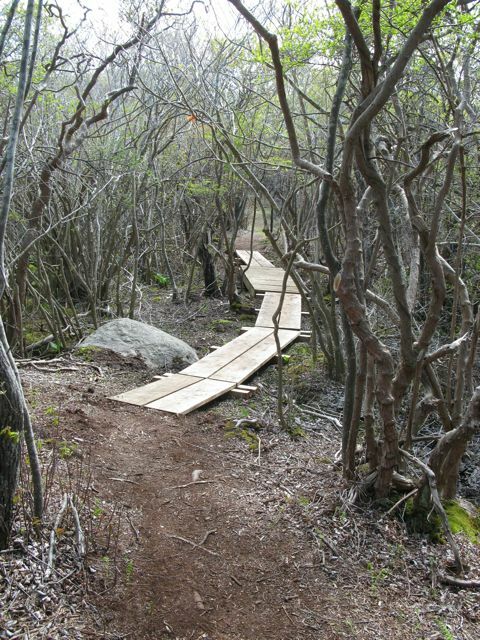 This leads to a well maintained system of paths in the Montauk Moorlands between the beach and Route 27. There is also a parking area that connects with these paths, located on the corner of Rte 27 and Old Montauk Highway just opposite the Theodore Roosevelt Indian Field County Park and Stables (you can not miss it). 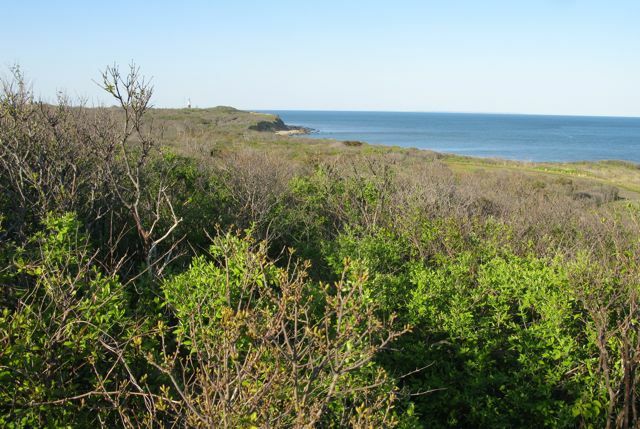 If you choose to access Amsterdam beach by walking through the Montauk Moorlands it is nearly a mile long walk. From Ditch Plains it is over 1.5 miles. I highly recommend an East Hampton Trail Guide map. These beaches are rough and poorly traveled. There are boulders jutting out of the ocean. These beaches have a reputation among fisherman casting for striped bass. The waters just offshore are replete with fish judging by the frequently seen trawlers and the birds trailing them. 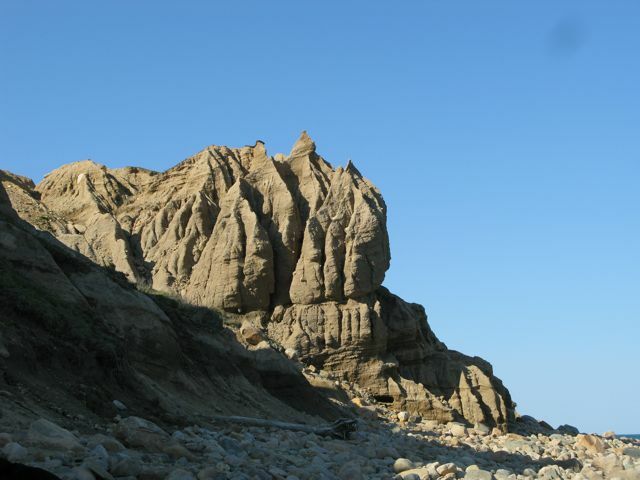 If you are a beach comber expect to find lots of moonshells, lots of drift wood, some interesting rocks and stones, patches of red sand and towering bluffs with wild looking “hoodoo” formations. Seeping out of the bluffs along the way are small ground water streams. Some of the water appears to be forming a hard grey layer at the base of the bluffs which looks just like cement. Could this be clay? Ditch Plains is famous for surfing due to its spectacular and consistent waves. Lifeguards are on duty during the summer season. A town permit is required. There are public facilities. 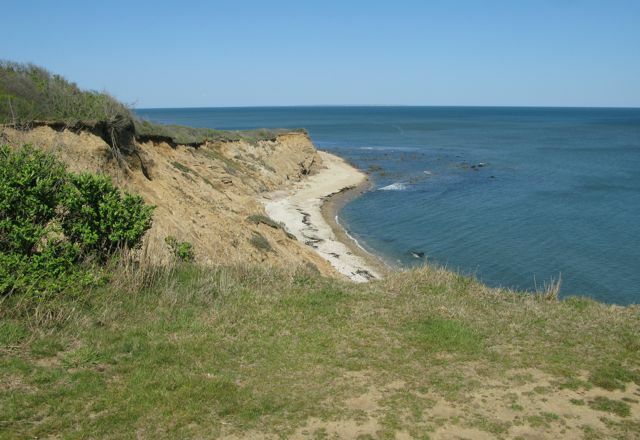 You can leave your car at the eastern end of Montauk (for example on S. Edison Street) and walk to Ditch Plains beach (nearly 2 miles due east). Or, you can drive via Ditch Plains Rd and leave your car at one of three beach access roads directly by the beach. On the eastern side the beach is bordered by a trailer park. Along Edgewater Dr. there are trailer homes on the ocean that rent for as much as 10,000/month! These homes are built right up to a rocky fortification meant to prevent erosion of the beach. 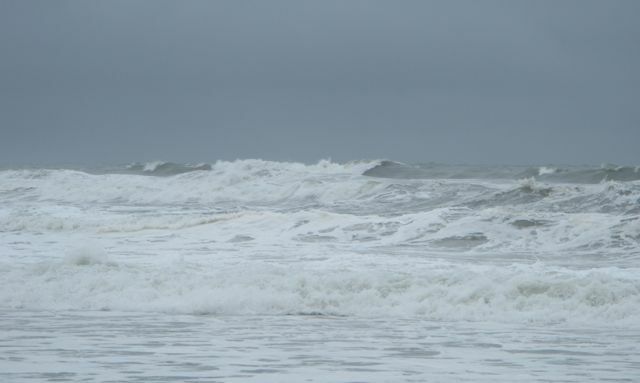 This also makes the beach impassable, specially at high tide. Going west from ditch plains, the beach runs along a cliff easily 40 feet high. On top of the cliff is Rheinstein Estate Park. Pictures of this beach abound on the web. 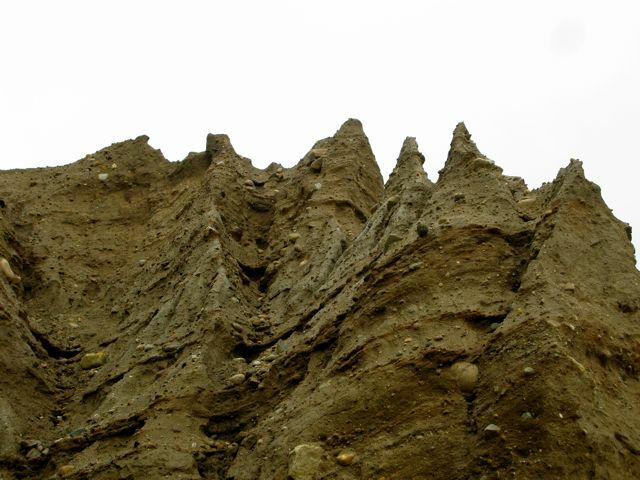 In places the weird formations of the cliffs, molded by wind and water erosion, remind us of places like Bryce Canyon in Utah! Along the beach the sights of “hoodoos” (the bluffs) are quite amazing and have been captured by photographer John Todaro amongst others. More pictures of the paths on top of the cliffs can be found on the web. To the east of Rheinstein Estate is Shadmoor Park and Nature Preserve, owned by the State of New York, the County of Suffolk and the Town of East Hampton. Shadmoor was acquired in 2001 and the 98.9 acres saved from being developed. The site contains diverse habitats and numerous rare plants, notably the federally endangered sandplain gerardia (Agalinis acuta). Shadmoor’s coastal bluffs, like those of Rheinstein Estate Park, offer spectacular views. Two artillery fire directing bunkers from the World War II era can be found on the property as one meanders Shadmoor’s many dirt roads and trails. The trails are great for hiking and biking! You can pick up a free trailmap at the kiosk in the main parking lot off Montauk State Parkway. You can also read about the history of Shadmoor on several posted signs by the parking lot. One sign summarizes the history of Camp Wikoff, once on this site, where troops led by Theodore Roosevelt were quarantined after the Spanish-American War. While only about 350 soldiers died in combat during this war, there were about 4000 fatalities due to tropical diseases contracted in the war! Hence the need for quarantine of returning troops in a desolate location…like Montauk! Don’t try climbing up these staircases! 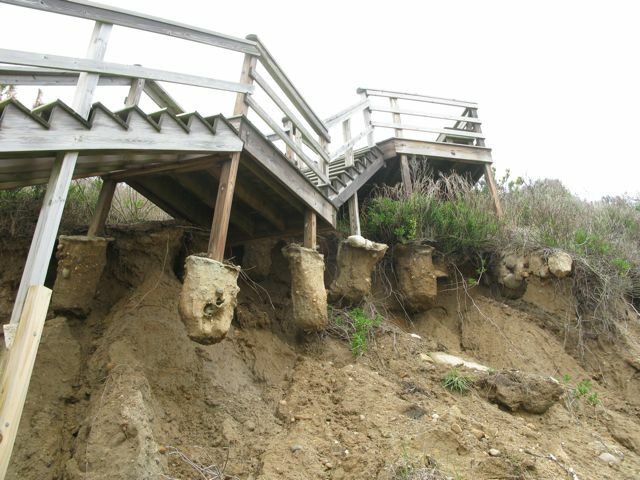 If you are walking on the beach you can inspect several flimsy staircases from the beach up to the homes perched precariously on top of the bluffs, off of Surfside Avenue. Every year they have to be reconstructed due to advancing erosion. On our last visit to this beach we came across a family of “rockhounds” from Maine searching for garnets on the beach. 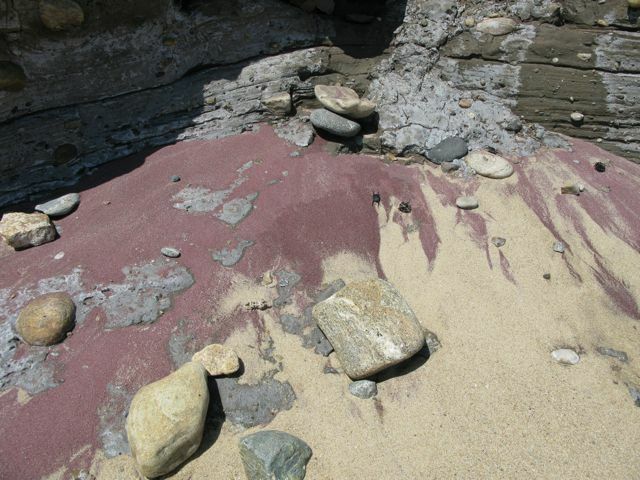 They chose to search in areas where there was dark redish sand, see the photo under beach #25. I doubt these are ground up garnets. More likely the red sand is due to iron oxides. The rockhounds from Maine were not finding too many intact garnets! Finally the beach finds include some interesting pieces of drift wood like this slice of a tree trunk which serves us well as a trivet for hot dishes. In the summer this beach is a “parking lot” packed with sunbathers. Montauk has always had a Jersey beach flavor to me. It is populated with weekenders and the tourists rent rooms in the local motels. The beach is really a promenade of beach side motels all with confusingly similar names. Starting in the west at S. Eton Street, there is the Oceanside Beach Resort with a large yellow smiley face painted on it and flying the ‘Don’t Tread on Me’ Tea Party banner! Heading east you walk past an area called Kirk Park Beach. There is the Montauk IGA just behind the dunes and across South Emerson Street with runs parallel to the beach. Then you get to Ocean End Apartments and Ocean Surf Resort. Their ad on the web shows people riding on horse back on the beach! Then there is the Ocean Resort Inn and the Ocean Beach Resort with a sundeck along the beach. The Royal Atlantic Beach Resort gets mixed reviews in spite of 2 swimming pools right next to the beach. The Sloppy Tuna is next, which reportedly hosts a “huge drunk crowd“. Then you pass by the Surf Club at Montauk which gets good reviews and finally you will pass by Atlantic Terrace on the eastern end of Montauk. They advertize “combining ocean breezes with the charm of Montauk” on their website. Enough said. This beach is for summer tourists. Gurneys Inn, about a 1 hour walk. 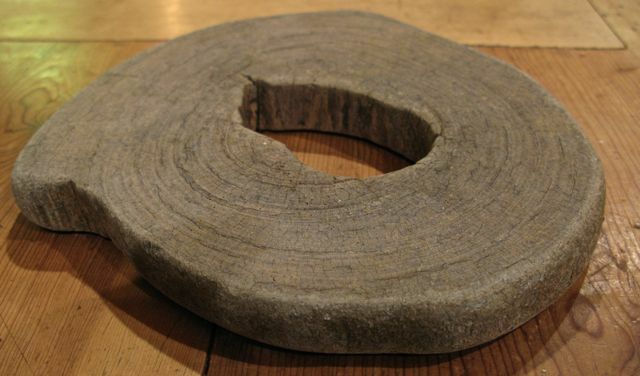 Most of the beach is sandy but there are some areas with quite a few beach stones – of interest to those who like to collect them. evidence of erosion caused by pounding storms. The bushes covering these bluffs represent excellent control against erosion. 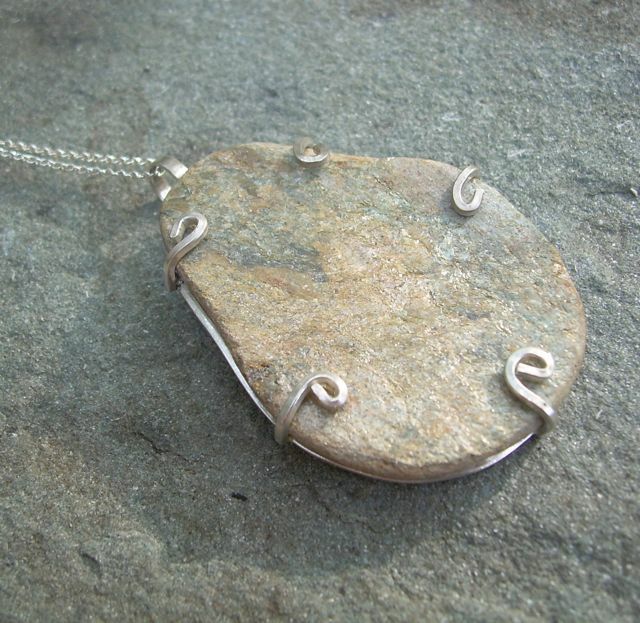 There are some spots where the tides have washed ashore a few shells and stones and we have used them to make pendents for necklaces. Here are some examples. This large camp ground is mobbed in the summer. It is nationally known and people come here from afar. In the winter it’s desolate and there is plenty of space to leave your car! Its a little over 1 mile to the east before you reach Gurney’s Inn. 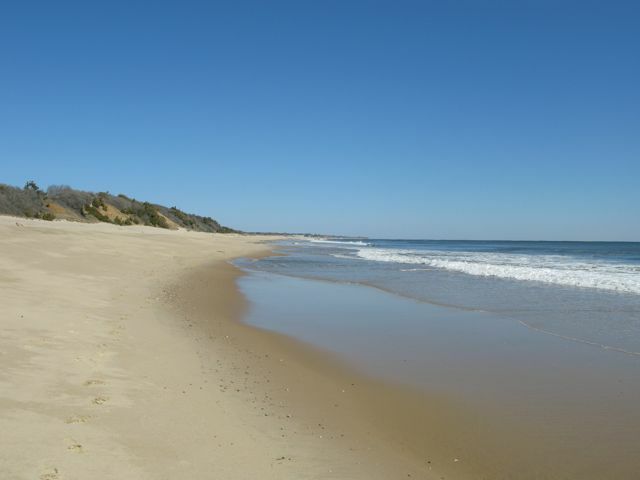 If you walk this stretch of beaches you will soon reach the end of Hither Hills state park and immediately the beach becomes populated with mansions built on the slopes rising up to Hither Hills and to old Montauk highway. There are quite a few motels here, all them with superb views of the ocean. The most famous of them is Gurney’s Inn, which boasts a spa with a 80 foot indoor pool with salt water and from which you overlook the ocean. Gurney’s Inn is one of several favorite Beach Wedding venues in the Hamptons. They even host an annual Wedding Show for interested couples that are planning a wedding. This event features local businesses and vendors. Maidstone Jewelry has exhibited it’s bridal collection at this event (see pictures). One bride with a beach wedding had her bridesmaids wearing jingle shell ear rings!